I’m back, as promised, to share some more of the cards we made at this last weekend’s Holly Jolly Stamp-a-Stack. You could choose to make this a 1 layer card, but I chose to make it 2 layers, to make it easier to emboss the panel using the Softly Falling Embossing Folder. First, you start with a panel of Whisper White cardstock, 4″ x 5 1/4″. Stamp the outline of the jar using the Jar of Cheer stamp set, using Memento Black ink. Next, ink up the tree image from the same set in Pear Pizzazz ink, and stamp it inside the outline of the jar. 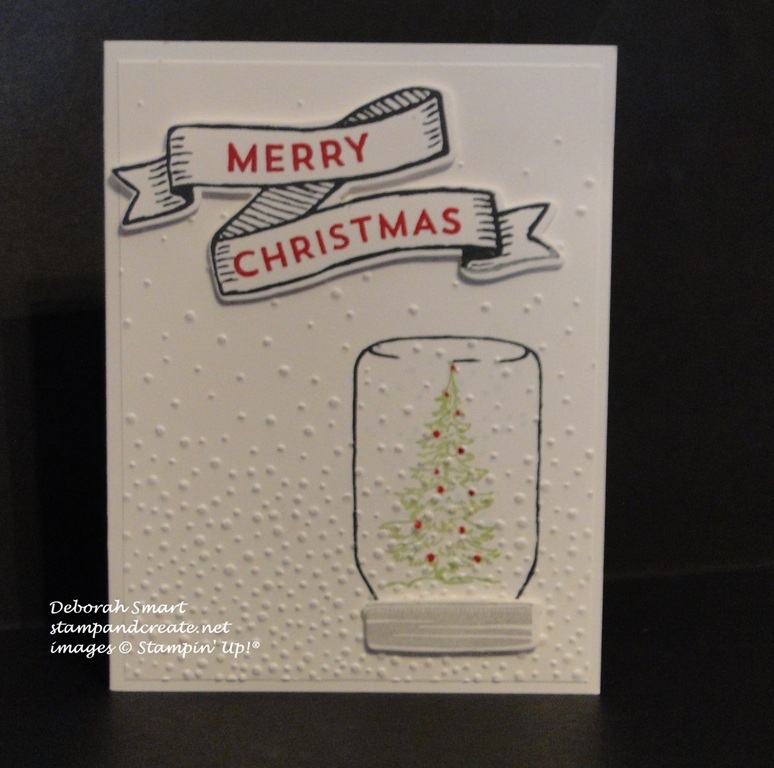 Use the Real Red Stampin’ Write Marker to add red dots, to symbolize red decorations, randomly on your tree. When that is done, use the Softly Falling Embossing Folder and Big Shot to emboss the snowfall onto your panel. On a separate piece of Whisper White cardstock, stamp the lid of the jar in Smoky Slate ink, and stamp the banner outline from the Banners for Christmas stamp set in Memento Black ink. Once your banner shape is stamped, line up your sentiment stamps on top of the banner, then pick them up with your Clear Block. I showed how to do this trick of lining up and inking your stamps this way in THIS BLOG POST – have a peek if you haven’t already seen it! After your sentiment is stamped, use the Big Shot and the Bunch of Banners Framelits Dies to die cut your banner, and the Everyday Jar Framelits to die cut the lid. Have I mentioned before how much I LOVE coordinating stamps and framelits!! Once you’ve attached the banner sentiment and jar lid, using Stampin’ Dimensionals, you’re almost done! Simply attach your panel to a card base of Whisper White or Thick Whisper White cardstock, add your inside sentiment, and you’re done. This next card uses the retired Tree Punch – but I bet I’m not the only one who still has it, and used it! In case you’re noticing a trend – yes, these cards are quick & easy to make, which is what you want in a stamp-a-stack! I’m learning; my first couple of stamp -a- stacks used to take for-ev-er, because my cards were so complex! This year, everyone was thanking me for simplifying things, so everyone was able to complete all of the cards, in less than the allotted time! 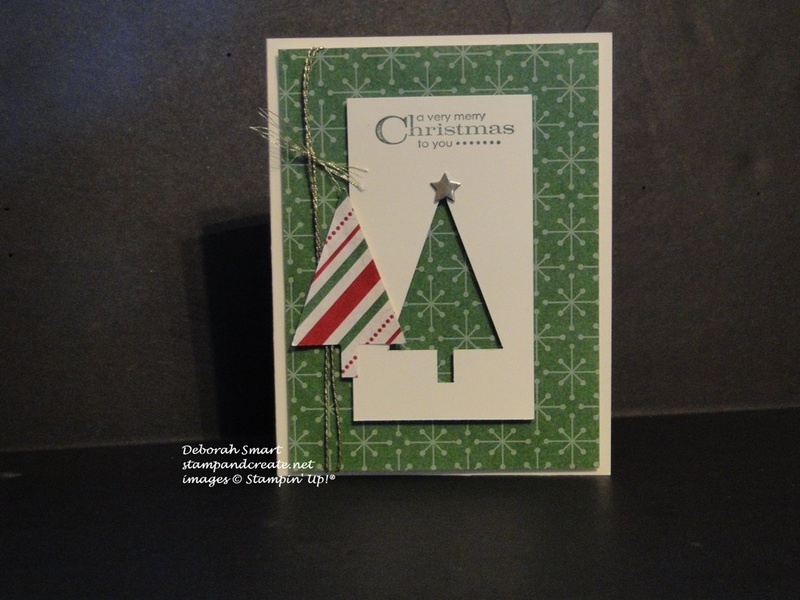 I first cut a 4″ x 5 1/4″ panel of patterned paper from the This Christmas Specialty Designer Series Paper. Next I cut a 2″ x 4″ panel of Very Vanilla cardstock, and used the retired Tree Punch to punch out the shape. I then used the same punch and DSP pack to punch out another Tree. I used a very old, retired stamp set for the sentiment stamped in Garden Green ink at the top. For the little star, I used the Big Shot and the Santa’s Sleigh Thinlits Dies to die cut the star from Gold Foil Paper, and added it to the top of the tree using Mini Glue Dots. Once the stamping was done, and the star attached, I attached the punched panel to the DSP panel, using Stampin’ Dimensionals. Then, I wrapped the retired Gold Cording Trim twice along the left side of the DSP, and tied it off in a knot. Once that was done, I added the punched DSP Tree to the side of the panel. If you’d like to order any of the products I used for these cards (non-retired), please click on the images below to go directly to my online store, or contact me directly to place your order. Remember that the Year End Closeout Sale is still going strong – there’s still time for you to shop & save! Be sure to come back tomorrow for my new cards for the Paper Craft Crew and Watercooler Wednesday challenges – they’re lots of fun, and you’ll get a sneak peek at some new products!